While Korea is the fatherland of our faith, Unificationists should remember that the peninsula continues to live under an uneasy truce signed 60 years ago this year. It’s also easy to forget that for 35 (in effect 40) years, it lived under oppressive Japanese colonialism, and that from 1895, two wars (Sino-Japanese and Russo-Japanese) were largely fought over it. We overlook that Korea has experienced 118 years of turbulence, captivity, division, and conflict. With the 24-hour news cycle, Americans understandably fixate on North Korea’s latest threats, but the underlying cause of the problem of North Korea is the absence of a peace treaty following the 1953 Armistice that halted the Korean War. Because there has been no permanent peace, the Korean Peninsula is inherently unstable in a neighborhood, as Rev. Moon’s words above attest, where the interests converge of four major powers: China, Russia, Japan, and the United States. The world media’s obsession with North Korea’s bizarre behavior and larger-than-life threats ignores the fact the North has remained a festering problem in international relations for decades. Since 1990, the almost exclusive focus has been on Pyongyang’s nuclear program. The North’s nuclear capability is extremely important and cannot be ignored, but the nuclear issue won’t be solved by focusing on it alone. The only lasting way to solve the problems presented by North Korea is to bring about a permanent peace agreement for a peninsula still in a state of war that will also lay the basis for eventual reunification. In the process, the nuclear issue will be resolved as part of comprehensive mutual security arrangements. Clearly, the primary purpose of current North Korean behavior is for domestic regime consolidation. Kim Jong Un, only 29 or 30, has to live up to the enormous reputation of his father and grandfather. In his first year of leadership, he tried to return balance to his regime by de-emphasizing the military and re-emphasizing the party—as it was in the days of his grandfather, Kim Il Sung. This was necessary to try to rebuild the North’s shattered economy. However, these steps likely brought Kim Jong Un opponents in the military, especially after he sacked some of its top leaders. Although Kim Jong Un is backed by his uncle, and more importantly his aunt, the late Kim Jong Il’s sister, this is not enough. In the North’s peculiar regime dynamics, Kim needs the absolute obedience and support of the military, otherwise there may be ongoing instability and unrest inside both the military and the regime as a whole. After Kim Il Sung’s birthday anniversary on April 15 and the end of annual U.S.-South Korean military exercises on April 30, we may see a slow — but bumpy — moderation of North Korean behavior as it tries to find an exit strategy to climb down from its threats. But, recent weeks have been one of the most dangerous periods in the peninsula since the Korean War. It has been less an issue of North Korea possibly attacking the U.S. or Japan, but more the risk of it undertaking new provocations against South Korea. Because the South is highly motivated to respond to the North’s threats, there is the ever-present danger of miscalculation by either side. Small actions can easily be misinterpreted and tensions can ratchet up in the blink of an eye. A second Korean War could begin unintentionally in any number of ways. For the past five years, South Korean policy has amounted to waiting for an impending North Korean collapse. 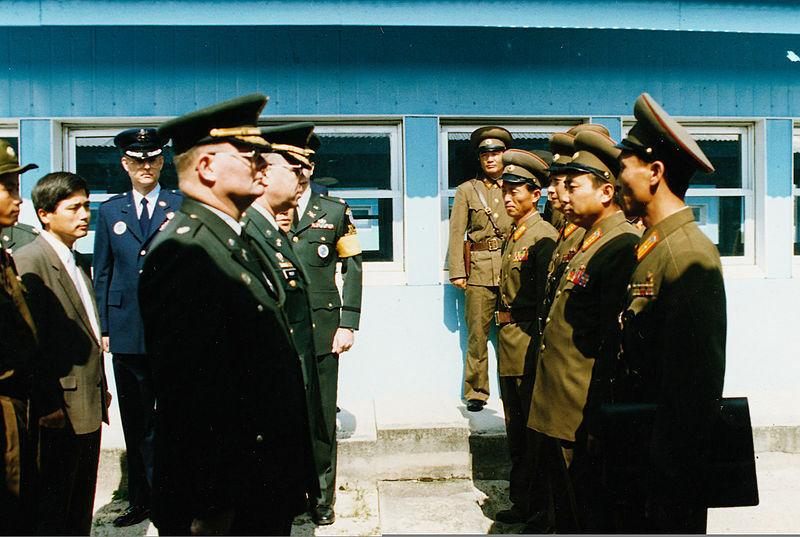 The previous ROK administration thought the best way to deal with the DPRK was basically to wait to pick up the pieces after it fell apart on its own accord. But this did not happen, even after Kim Jong Il’s death, and South Korea’s policy of no engagement or aid to the North under almost any circumstances ended unsuccessfully. It arguably even created a vacuum of relations that the North filled in 2010 when it sunk a South Korean naval vessel and shelled an island near the DMZ. 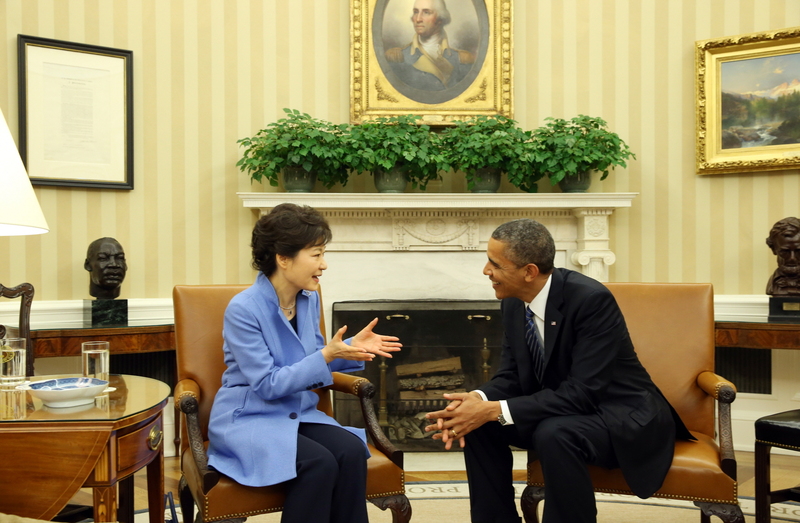 President Park Geun-hye of the Republic of Korea and President Obama meet in the White House, May 7, 2013. The new Republic of Korea government led by President Park Geun-hye (who met Kim Jong Il in 2002), that took office in late February after the North’s third nuclear test, wants to establish a new policy of trustpolitik, designed to separate the nuclear issue from other aspects of inter-Korean relations. However Madam Park inherited an already very difficult situation, which mounted in intensity over the last few weeks. She is also dependent upon America’s security protection, including its nuclear umbrella, provided by a 1954 treaty. Under present circumstances, she cannot easily move forward diplomatically until the threat wanes. Now more than ever we need clear policy direction and diplomatic action towards the establishment of a permanent peace regime on the Korean Peninsula. President Obama’s first term policy of “strategic patience,” which amounted to benign neglect, no longer suffices. One cannot avoid a problem and expect it to get better. We should not wait for North Korea to find another opportunity to ratchet up tensions even further and more dangerously. We have the precedent of the 1997-98 Four Party Talks, which included the U.S., China and two Koreas. Its purpose was to lay the basis for the “successful conclusion of a peace agreement which would bring lasting peace and stability to the Korean Peninsula and contribute greatly to the peace and stability of the entire region.” These talks should have continued, but fell apart because of mutual mistrust between the U.S. and North Korea. The U.S. briefly attempted senior-level engagement with the North in October 2000, with North Korea’s top marshal meeting President Clinton in the White House, and Secretary of State Madeleine Albright visiting Pyongyang three weeks later. 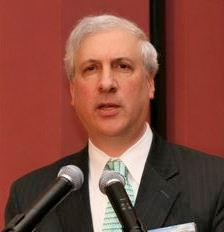 A joint communiqué was even issued that month, stating “neither government would have hostile intent toward the other” and confirming “the commitment of both governments to make every effort in the future to build a new relationship free from past enmity.” But senior-level engagement halted and relations deteriorated in the George W. Bush administration. President Park will visit the White House on May 7. It will be her first chance to meet President Obama, upon the 60th anniversary of the U.S.-ROK alliance. She is expected to announce a Northeast Asia Peace initiative or “Seoul Process,” probably at her speech the next day before a joint session of Congress. But there will be no better opportunity after this latest crisis with North Korea for the two nations to agree to launch a high-level diplomatic process toward a permanent peace agreement on the Korean Peninsula. The cooperation should be sought of China, Russia, Japan, as well as the United Nations (under Secretary General Ban Ki-moon), to resume the political process inconclusively begun at the 1954 Geneva Conference on Korea. Dr. Barry has followed U.S.- DPRK relations for the last 23 years, and met President Kim Il Sung with a delegation from the Summit Council for World Peace in 1994. An earlier version of this article was published on the Opinion page of FamilyFed.org (see comments to it as well). He is managing editor of the Applied Unificationism blog, and associate editor of the International Journal on World Peace.